Tipping in bars has always been wildly confusing, and there's no real hard and fast rule for it. A dollar for every drink? Two dollars for two? A 20% tip on a card? Basically no one has any idea how you're supposed to tip in a bar, and soon, you may not have to worry about it at all. 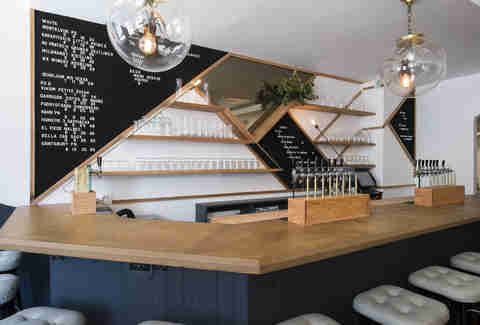 About two weeks ago, Lois, the all-tap wine bar in the East Village, decided to ban tipping. Lois is NYC’s first bar to implement this. (Danny Meyer's Union Square Hospitality Group said that its bars and restaurants will eliminate tipping over the course of 2016, so Lois is the first bar to actually put it into practice) A number of major restaurants have joined the no-tipping movement this year, including Craft, Eleven Madison Park, and most visibly, Meyer's USHG, as well as many others in and outside of New York City. But there’s a difference between Lois and the larger establishments taking on the trend: Lois has only about 10 employees, and while it does serve food, it is still primarily a bar. As such, it’s got a pretty tiny kitchen, so there isn’t really a “back of the house,” like there is in a restaurant. But co-owner Nora O’Malley sees this as one of the greatest parts of the no-tipping movement, that everyone can adapt the model to their specific business. One of the main drives for Lois to ban tips was to offer the staff a “predictable wage.” “Personally, I don't think it should be revolutionary to know whether or not you can pay your bills this month,” O'Malley says. Sans tips and with a significant increase to the base wage, Lois employees are now making as much, if not more, than they were before. Would You Pay 35% More to Not Tip at a Restaurant? As for the price increases, it's hard to imagine there will be complaints from customers. 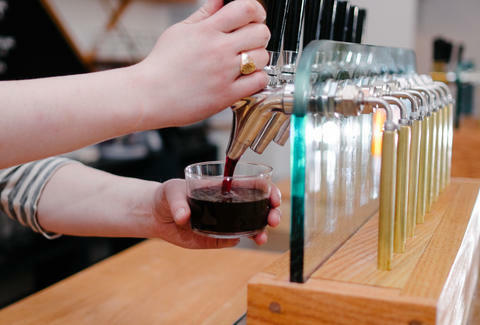 Since it's an all-tap wine bar, Lois can raise its prices in pretty small increments. So, the cheapest glass of wine only went from $5 to $6, and the most expensive liter (Lois serves large-format, too) only increased from $70 to $80. “To reassure anyone who is worried about incentives for great service, we explain that we included a revenue share into our model, so we effectively built in a floor, but no ceiling,” O’Malley says. With Meyer’s bars (and restaurants) rolling out their “Hospitality Included,” no-tipping program over the course of 2016 (so far, it’s only happening at The Modern), it'll be interesting to see if other bars choose to follow in Lois' footsteps. For now, there's at least one place where you can go forth and drink your drinks without that 10-minute debate about how much you should tip.